Unfortunately, the honest gut feeling of what a good photograph is – what it represents, the subject matter, its composition, its context, its purest aesthetic form, it seems, are no longer so important, but rather ” .. it looks like a Stephen Shore, a Gursky or an McCurry”, even. Because of modern digital media today allows almost every camera owner to post and receive feedbacks instantly, the saturation of imagery on the internet has allowed the comparing and contrasting to go awry, with no real judgment passed except perhaps limited to a few words like to “great shot!”or “nice photo!” There just isn’t the time and knowledge, to give a more constructed analysis and critique of the hundreds of thousands of pictures that get posted daily. Besides, what if you don’t like a photograph? You simply ignore and move on to the next one. A lot photographs I see now tend to be emulations rather than creations and although this isn’t so bad in a sense, since “everything has been photographed” as Sontag puts it, and imitation is the highest form of flattery, it begs me to ask then, why photograph? Aren’t collecting perfect picture postcards sufficient? What do we photograph at all? It must be because we can add value to the image through our personal expression and understanding of what surrounds us in our daily lives. Just like a painter and brushstrokes, the camera operator can mark his or her expression with the click of an f-stop, or the turn of the zoom ring, or even shoot off the hip! Can photographers become critics and curators? I can only recall a handful of art curators that have been established photographers in their own right. As far as I know, curators and critics are nearly always taught from an art background, subjected to art history as a major or even developed their visual skills as picture editors or journalists. Perhaps curators have to be all-encompassing in their visual interpretative skills, and can see instantly what a good image is, its intrinsic ‘commercial’ value. Whether the general public ‘gets it’ is anybody’s guess. This can be said of contemporary conceptual works. Working as the artist’s pundit, curators must be able to enter the artist’s mind and skillfully scrape out the hidden messages and meanings which often, are securely embedded. The way I see it, photographers can never be good critics, especially of their peers. Curators, cannot be great photographers, as their remit is too wide. Unexpected things happen when you least expect it. 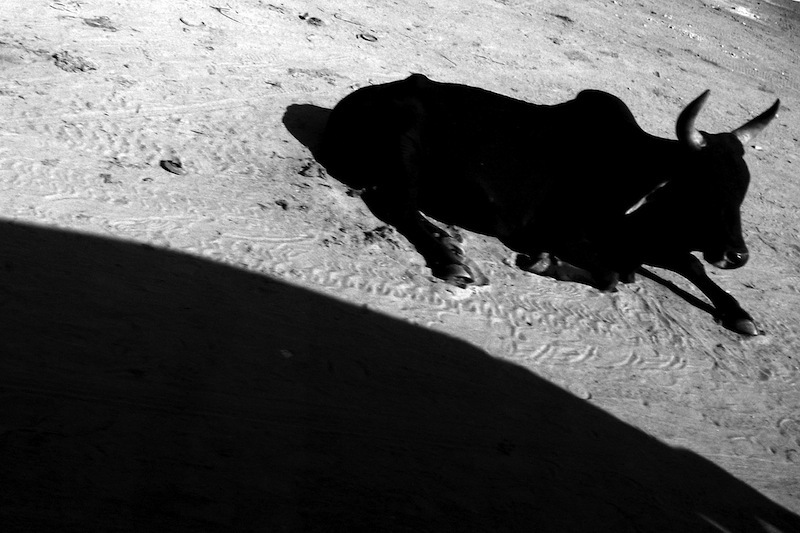 I was going through some of images shot in Rajasthan, India recently and came across this ‘odd’ photo of a black cow lying on the sandy ground, with a heavily cast shadow, of which must have been from our minivan. I don’t remember taking the picture but must have been one of many, shot through the vehicle’s window as we drove from Jaipur to Jodhpur. I nearly hit the delete key, but had a second glance at it. Then I knew I had a keeper. 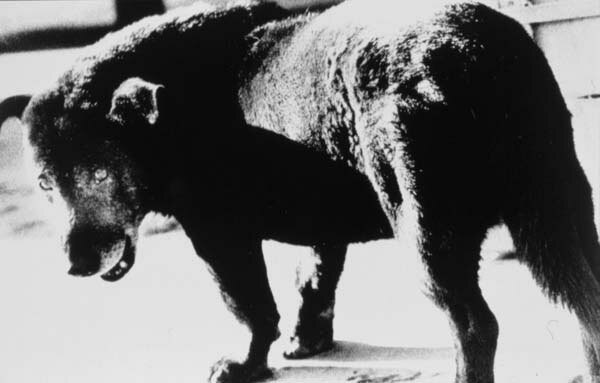 One of the strangest and most disturbing photographs which I have come across is the image below of the stray dog by Daido Moriyama, whose work I greatly admire. This photograph at first glance, a high contrast print, grainy, seemingly unbalanced and oddly out of proportion stuck in my mind. 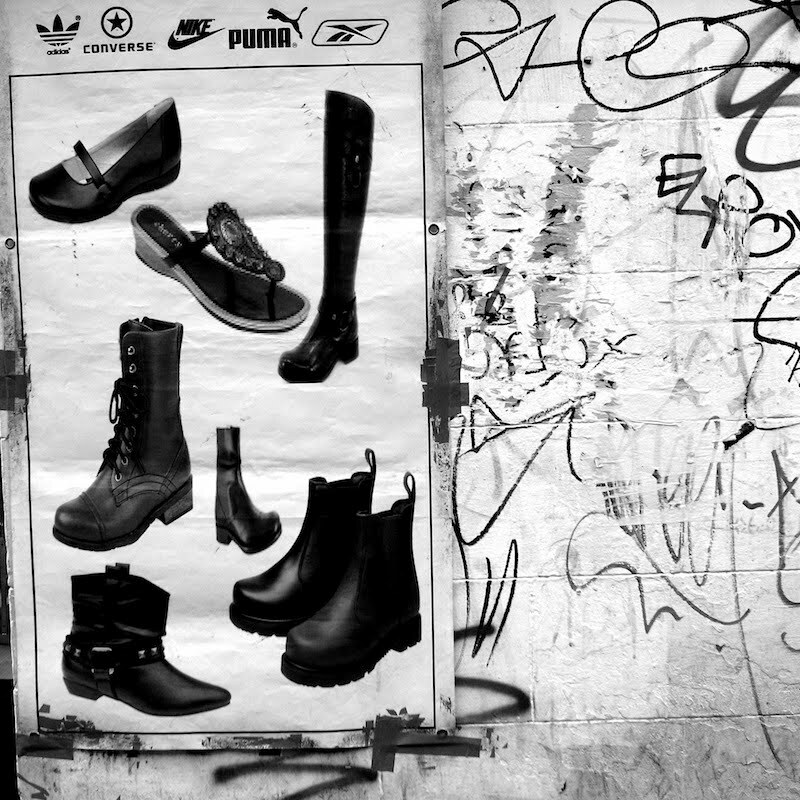 Once you have seen it, you will never be able to erase it from your visual vocabulary. Its menacing stance and almost perceptible growl affected me subconsciously and everytime I face a barking mutt, the image of this stray comes to mind. My image of the resting cow of India reminded me of the stray dog! Similar, yet miles apart. The perception of blackness and negativity that emanates from both images evokes the same feeling for me. A feeling of brooding intent, a kind of fearful apprehension. In breaking down the images, I see mainly dark geometric shapes in both photographs, over-laid by the image of the dog’s head and in my picture the texture of the sand from the tyre marks. Positive and Negative space. Dimensionally opposed to each other, one recedes and the other approaches. It is this ‘tension’ in the photographs which creates the drama much absent in many photographs today. Robert Frank’s photographs of American suburbia have spades of it. So has Klein and in Ralph Gibson’s works.